Opened in 2015 by Pascal Champoux, Abdelilah Chiguer and Norbert Langlois, passionate collectors, Galerie 3 is dedicated to professional Canadian contemporary art. Renowned for its convivial atmosphere, Galerie 3 stands as a reference location and meeting spot for art lovers, novices and collectors alike. 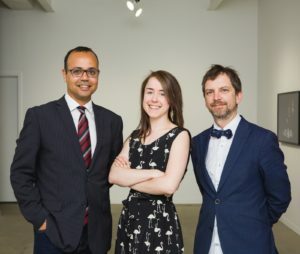 Friendship, a common passion for contemporary art and the desire to stimulate this market provide the Gallery’s founders, also collectors, the necessary stimuli to take the leap and represent artists with undeniable talent. From this moment, a guideline will prevail: to promote the work of artists in whom they have complete confidence with unwavering commitment.